Provided photo Kyle Ahrens participates in the Explosive Speed and Power Camp. The UVMC Center for Sports Medicine will offer summer sports performance and injury reduction programs for junior high, high school and collegiate level athletes. TROY — The UVMC Center for Sports Medicine will offer summer sports performance and injury reduction programs for junior high, high school and collegiate level athletes. Programs will begin June 3, with a May 24 registration deadline. The Edge Camp Jr. program is designed for athletes who will be entering grades 6-8 next school year. It uses the same techniques and philosophy as the Edge program, but is designed with the musculoskeletal differences of younger athletes in mind. Edge Camp Jr. will be offered at Tippecanoe High School Mondays through Thursdays from 11:30 a.m. to 1 p.m. June 3 through July 18. Cost is $250. 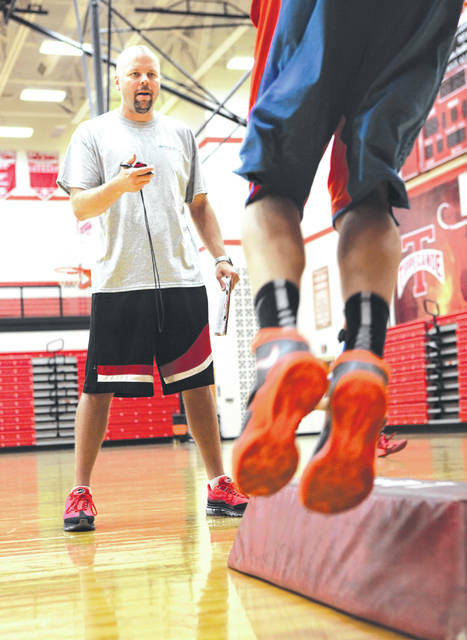 KneeFit will be offered at Troy Junior High School Mondays, Wednesdays and Fridays from 9-10:30 a.m. June 3 through July 18. Cost is $225. Registration by May 24 is required for all programs. To register online, visit UVMC.com/Sports-Medicine/Athletic-Performance-Programs/. To register by phone, call Carefinders at 1-866-608-FIND (3463). For further information, contact the UVMC Center for Sports Medicine at 667-2614 or 440-7152.
https://www.dailycall.com/wp-content/uploads/sites/30/2019/03/web1_UVMC-sports-enhancement-programs.jpgProvided photo Kyle Ahrens participates in the Explosive Speed and Power Camp. The UVMC Center for Sports Medicine will offer summer sports performance and injury reduction programs for junior high, high school and collegiate level athletes.